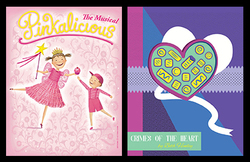 In less than a week, the SummerStage Festival at Stephen F. Austin State University will open for its three-week run of the two featured plays, - the family friendly "Pinkalicious the Musical" and the Pulitzer Prize-winning "Crimes of the Heart." The festival runs June 29 through July 19. NACOGDOCHES, Texas - In less than a week, the SummerStage Festival at Stephen F. Austin State University will open for its three-week run of presenting a fun and heartwarming children's musical and an emotionally powerful American play for the 2018 summer theatre season.